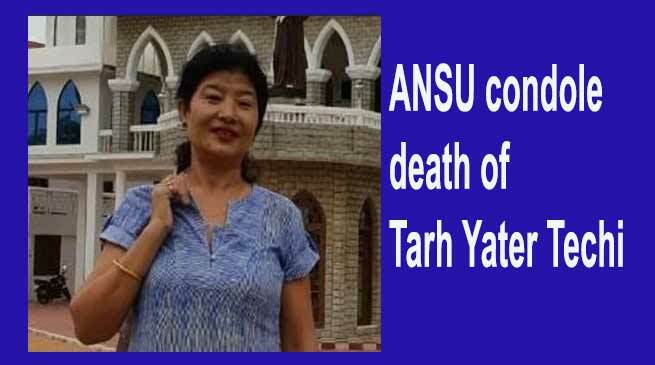 All Nyishi Students Union (ANSU) joined the condolence of the death of its former leader Late Tarh Yater Tehi on June 27 late evening. ‘She was a strong lady, during her time she focused major issues of the community. She serve as acting president during the year 1986-1987 of All Nyishi Students Union (ANSU). The release while pray for eternal peace of departed soul to rest in peace. In a message to the ANSU stand with the family of Techi lala of this hour of grief, may Lord give strength to the bereaved family overcome the irreparable loss. Late Techi Yater was only 44 as born on 26.05.65, and is survived her husband, a son and a daughters and other in-laws. A graduate with History honours from Lady Siram College, University of Delhi in 1987 when she had worked on NSS dowry cell legal literacy campaigner. She served as personnel manager of Arunachal Pradesh Industrial Development Corporation Limited (APTDFC) before taking voluntary retirement. Her last journey was performed today at Model village resident here where hundreds of family members, relative friends and people from business community were present.